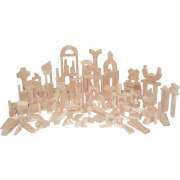 Your preschoolers will stretch their imaginations with our beautiful building blocks. We have both wooden blocks and soft play blocks so you can choose the material that best suits your students, or order a mix. 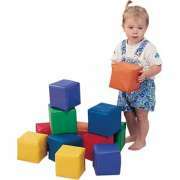 Blocks help little ones develop important skills as they play. When you want some great activities and toys for a preschool, daycare or recreation room, Hertz Furniture offers quite a selection. How can you encourage kids to play with blocks? Our collection from top preschool equipment manufacturers including Wood Designs and Children’s Factory will entice little ones with bright colors and exciting shapes. If you are looking for a way to increase hands-on learning in a preschool, daycare or kindergarten classroom, wooden blocks will create an excellent opportunity. 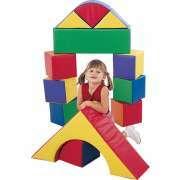 They can be used to teach about shapes, colors, balancing, building and more. You can get the whole class involved in a cooperative building project or ask particular students to help identify different shapes and colors when they are all mixed up. Preschool learning centers create an organized classroom in which children are encouraged to take initiative and explore. 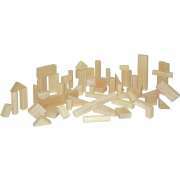 Soft blocks, wood blocks and plastic blocks can all be part of a building center. When little ones choose to undertake a project with blocks, they are developing their motor skills while practicing the planning and execution of a design. Even the youngest students in a daycare center will enjoy building and knocking down block towers. Should I get soft blocks or wooden blocks? With a variety of materials, styles and designs to choose from, we have building blocks that will fit in any educational setting. 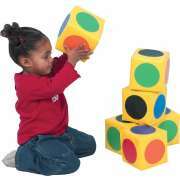 Colorful blocks entice young ones into educational fun and can really brighten up a classroom. Classic wood has a calming appeal and a natural strength that will withstand the test of time. 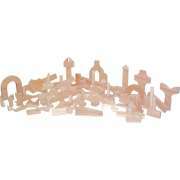 We also have plastic blocks which are vibrant and excellent for building projects. If you are looking for a some creative classroom furniture, cube chairs are an excellent option. 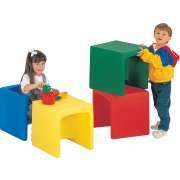 Little ones can choose to use them as chairs, tables or even large stacking blocks. 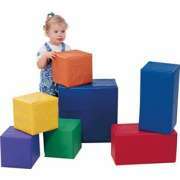 They are lightweight yet sturdy so children can move them independently. What are the safest blocks? 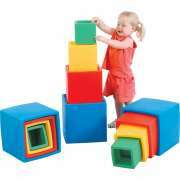 When you want to teach your youngest students about the fundamentals of building, shapes and colors, soft foam blocks will make a great choice. Because they are so lightweight, they are a safe choice, even for small children. They can be used in conjunction with play mats to create fun activities. 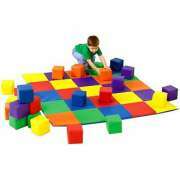 Children can match soft blocks to colored squares on the mats or create their own patterns and games. 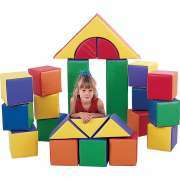 We have fun sets of large squishy blocks which can be used to build a house, school or anything else young imaginations can come up with. 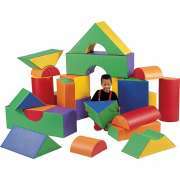 The variety of shapes offers endless possibilities for the children in your preschool or Pre-K class. 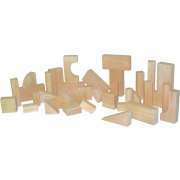 Classic wooden blocks come in large sets which make them perfect for a big group of students. With tons of pieces, many children can do independent projects or play together. There will always be enough to go around so lots of kids can join in the fun. 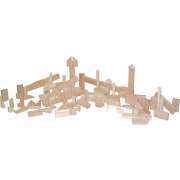 Wood blocks can can be used by themselves or in conjunction with other toys to create fun venues such as houses, zoos or towns for imaginative games. Do you have any other kinds of building blocks? Do your students get frustrated when they spend time constructing towers that are accidentally knocked over by their friends? Snap Blocks from Children’s Factory snap together, so structures won’t topple over if they are accidentally bumped into. 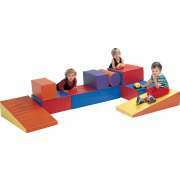 They have no sharp corners, so children are protected as they play and explore. 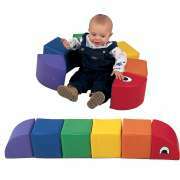 Nesting blocks are another option that works well in an early-childhood setting. They fit right in to each other, creating a great way for children to learn about sizes and shapes. Even cleaning up can become a game when little ones are challenged to fit the plastic blocks together in order as fast as possible. This design also facilitates compact storage. Building blocks are an essential component of a child’s educational experience. With Hertz Furniture’s great selection of styles, materials and sets you can find great options for children in a variety of developmental stages and ages.